We are notoriously late eaters. Especially in the summer, when my husband and I use every minute of sunlight to work outside, we do not sit down for dinner before 8:30 or 9:00 o’clock. People around here eat as early as 5 and certainly not later than 6 o’clock. Last week, when my son’s friend stayed for dinner, I asked him jokingly how he puts up with our moonlight dinners. He told me that he usually has dinner at home before coming here. This could be either a compliment for my cooking, or simply the fact that 19-year-old boys are always hungry. I won’t speculate. For my part, I am usually famished by the time I have dinner on the table because I often don’t eat much during the day. Yes, I know, that’s an unhealthy habit. However, when I know there is something appealing in the fridge, I find it easier to pull myself away from gardening to have a bite. 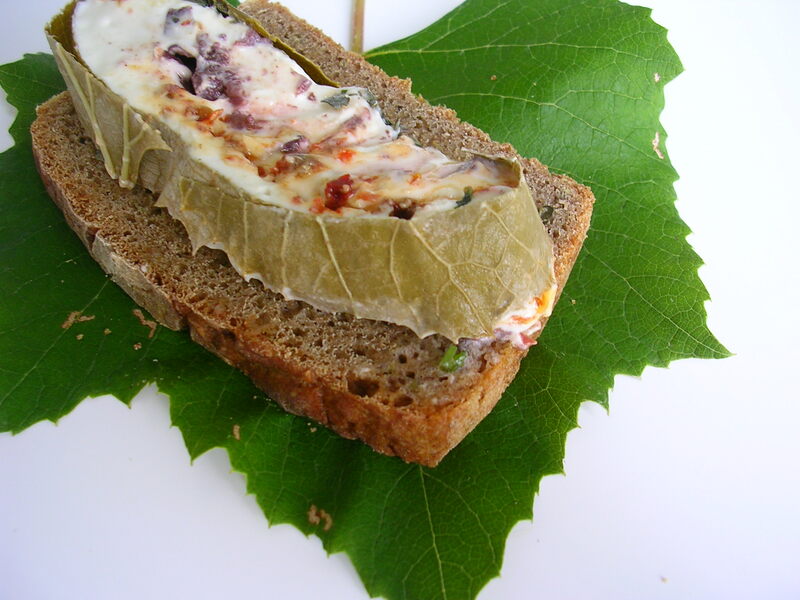 I had the idea for a terrine like this for a while but I had to wait for the leaves on my two concord grapes to grow big enough. I mix the herbes de Provences from equal amounts of dried basil, sage, rosemary, summer savory, thyme, marjoram, fennel seeds, oregano and lavender. 1. 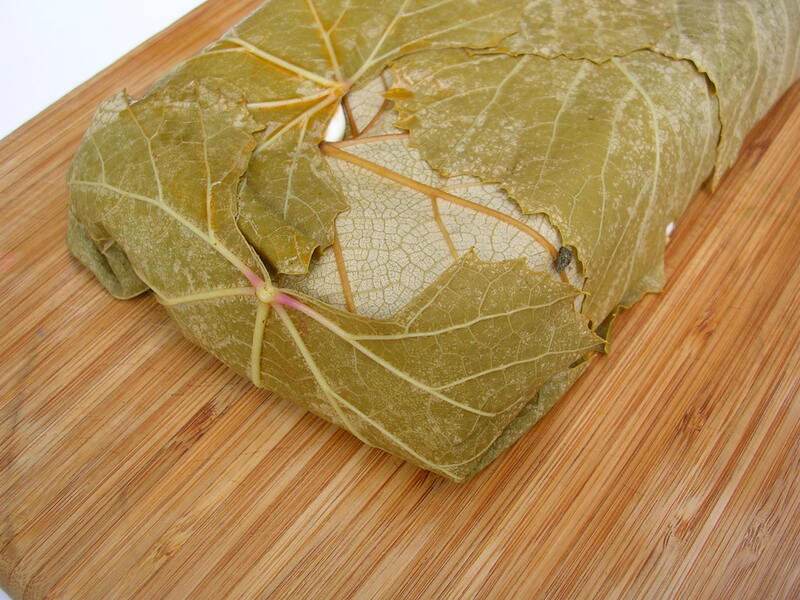 Wash the grape leaves and place them in a heatproof bowl. Pour boiling water over them to cover. Let stand for 4 minutes, then drain and spread on paper towels to dry. 2. Beat the goat cheese and the cream with an electric mixer until smooth. Try not to add more cream, otherwise the cheese will end up too liquid. Mix in the garlic. 3. 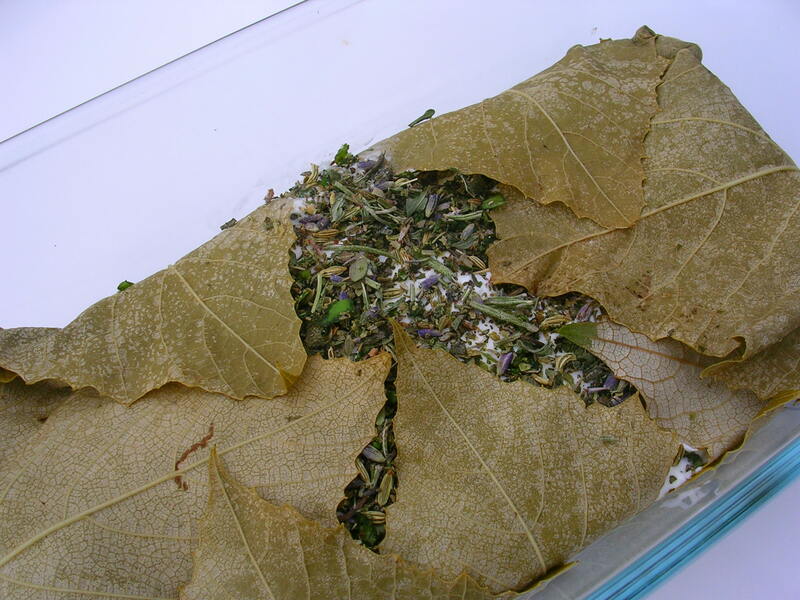 Line a rectangular small glass dish with the leaves up the sides, so you can fold them over after filling. 4. Spread 1/3 of the cheese on the bottom. Evenly sprinkle with the tomatoes. 5. Spread 1/3 of the cheese and evenly sprinkle with the olives. Spread the remaining cheese on top and sprinkle with the herbs. 6. Fold the leaves over. Cover with plastic wrap and refrigerate for at least 2 hours. To serve, flip the terrine over onto a serving dish or a nice cutting board. A serrated knife works best to cut through the grape leaves.